Studded tire season ends March 31 | Banks Post | Local news from Banks, Buxton, Manning, Roy, and Timber. Studies from Japan and the U.S. automobile tire industry say a safe alternative exists to typical road-damaging steel-studded tires. The deadline to remove them is fast approaching. OREGON - Drivers cruising along in an automobile or stopped in a busy parking lot often hear a clackety-clack from tires on nearby cars. 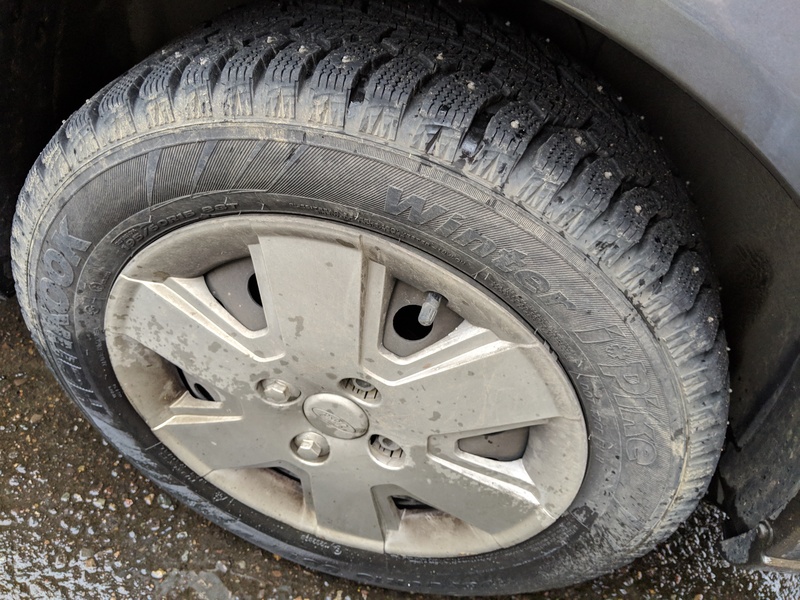 It’s not difficult to hear when a car owner continues using studded tires, swerving around Oregon law, by continuing to drive on them past the upcoming cutoff date. The deadline in Oregon for changing studded tires back to “regular” tires is midnight Sunday, March 31, but that doesn’t deter many car owners from procrastinating about making the change at his or her pace and convenience, even at the risk of a presumptive $160 fine for a Class C equipment violation. “Drivers are encouraged to not wait until the March 31 deadline to remove their studded tires, especially if they aren’t driving in the mountain passes between now and then,” said Luci Moore, ODOT’s state maintenance and operations engineer. ODOT says studded tires also over time cause major damage to local, county and state roadways. A 2014 study conducted by the state agency concluded that studded tires cause about $8.5 million in damage each year to Oregon roads, highways, and freeways. There are other types of tires available to drivers who wish for an alternative to studded tires or chains -- traction wheels that meet the Rubber Manufacturers Association (RMA) standards for use in snow, ice and other types of severe winter weather conditions. RMA research shows that alternative winter traction tires, easily recognizable by an emblem of a three-peaked mountain depicting a snowflake in the center, cause no more damage to roadways -- as opposed to standard studded tires or chains -- than typical, all-weather radial tires. One issue RMA research found -- an all-too-familiar outcome recognizable to drivers who regularly use Interstate-5 in the Willamette Valley -- shows that studded tires eventually chip away at asphalt, cutting grooves into the roadway that during rainstorms fill with water to create a hydroplaning hazard. Anecdotally, for decades now Oregon drivers, notably state politicians, who frequently use I-5, have said he or she can drive on the freeway between Salem and the southern edge of Portland without keeping his or her hands on the steering wheel because the ruts in the road are so severe they practically guide the car autonomously. Bridgestone Tires, which is not a Banks Post or Gales Creek Journal advertiser, states on its website that advances in rubber compounds, tread design, and other winter tire technologies lead to the creation of modern studless snow tires for use in freezing temperatures that are capable of maintaining flexibility. The increased flexibility in the non-studded tires’ rubber, which has deeper tread depths than “all-season” or “summer” tires, allows drivers to maintain traction on wet, snowy and icy road conditions. During winter months, the rubber in these newer studless tires packs snow within the tread blocks, providing for snow-on-snow, better traction. Studless tires also contain tiny grooves, called sipes, within each tread pattern that provide “biting edges on ice that help with “acceleration, deceleration, and stopping,” Bridgestone’s website says. The Japanese are believed to be the first country to develop non-studded tires in response to wear and tear on roadways, according to online searches. The study found a direct correlation between studded tires and air pollution caused by concrete dust rising into the air as a result of wear and tear caused by studded tires. As a result, Japan outlawed their use, however, it should be noted the study also found that the Japanese-engineered alternative, which uses special tread-rubber compounds in place of studded tires for enhanced traction on ice and snow, does not provide totally equal traction on all types of winter weather roadway conditions. An ODOT press release dated March 21, 2019, says these alternative winter traction tires, also known as Nordic or soft-compound winter tires, meet RMA standards for use in severe snow conditions and provide better traction than studded tires when used on bare pavement. “Drivers with studded tires on their vehicles after the March 31 deadline can be charged by law enforcement with a Class C traffic violation,” ODOT spokesperson Peter Murphy said. “If you must travel when weather conditions present difficulties after March 31, use other types of traction tires or chains, or postpone your travel until conditions change for the better,” he said. An interesting note on the deadline for removing studded tires is that in 2018 both Washington Department of Transportation and ODOT extended the studded tire deadline in their respective states to April 15 due to forecasts calling for late-season snow that could impact travel throughout both states. Previous to April 2018, the last time the ODOT extended its March 31 deadline was in 2012. ODOT says maintenance crews will continue to monitor highways and weather forecasts and will work to clear any late-season snow or ice as soon as possible. For the latest Oregon road conditions go online to www.TripCheck.com or call 5-1-1.